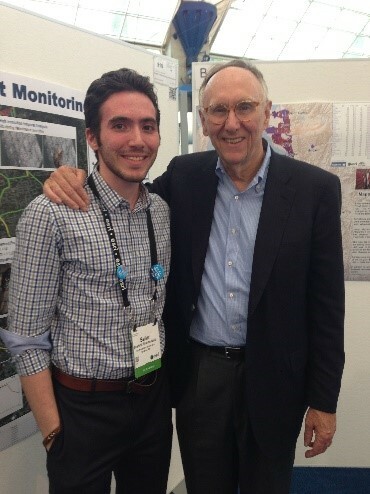 StreetScan is now an Esri business partner in the Esri Startup Program. The company provides end-to-end asset management services to municipalities. Built on ArcGIS, StreetScan’s web-based GIS application is a monitoring and management platform for smart, comprehensive, and accelerated evaluation of transportation infrastructure. Only a year into its operations, StreetScan’s pavement monitoring platform is already used by 15 cities around the US and has generated international interest from countries such as Canada, China, and France. 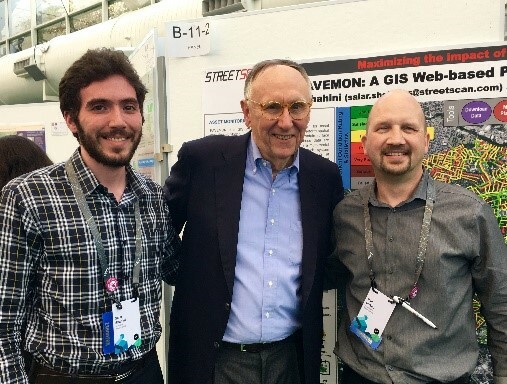 StreetScan was one of the 33 startups showcased at the 2016 Esri UC Startup Zone and in the annual Map Gallery. The team reconnected with Dangermond at UC and shared the success and transformation of a research project to a thriving startup. StreetScan is working hard to save cities time and costs, reverse the trend of crumbling infrastructure, and set an example for commercializing the many innovative technologies produced in universities. To see the technology in action, visit streetscan.com.